This is one of my favorite types of books...realistic, but with a bit of the fanciful. For example, Becca is a lightning strike survivor and sometimes clocks run backwards around her. To me, the author did a good job developing the characters and I really cared about them. There is some tragedy in the book, but there is really good closure, as well. Actually, there is such good closure that the end of the book has where-are-they-now paragraphs about the minor characters - kind of like the movie, "Animal House," if you are old enough to remember that! This is a great book to read or give as a gift. 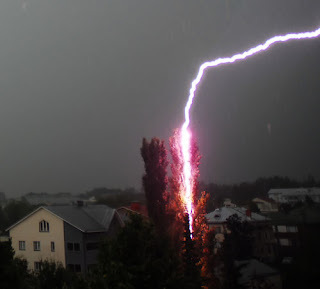 By the way, I found the cool lightning picture at http://www.guzer.com/pictures/lightning-nails-tree.php. Thanks for the awesome review! And I meant the end to be reminiscent of Animal House! Thanks again.